Though Jake Gyllenhaal did not get so much as an Oscar nomination, much less a win, for his exceptional performance as a videographer of terrifying ambition in Nightcrawler, his work topped the annual Village Voice Film Poll and won him a place on our list of best male performances. Gyllenhaal lost a lot of weight to transform himself into a gaunt creature of the night—our description likened him to “a preying mantis as much as a man”—so it’s been particularly shocking to see the actor, one year later, transforming himself into a beefy, muscle-bound Junior Middleweight Champion for his new movie Southpaw. Sons Of Anarchy creator/Internet troll Kurt Sutter originally conceived Southpaw as a vehicle for Eminem, whose troubled life and unconventional artistry informed Sutter’s script about a left-handed fighter who tries to overcome personal tragedy. That script has since fallen into the hands of director Antoine Fuqua, and though Eminem has contributed an original song to the film, Gyllenhaal has taken over the part originally intended for him. 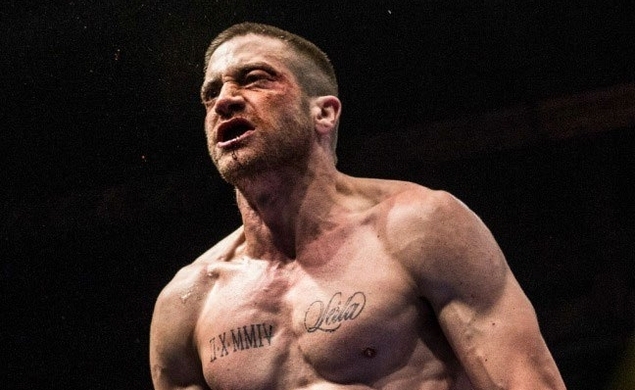 Despite Sutter’s reputation as a self-styled rebel, there’s nothing in the plot of Southpaw blows up the conventions of your standard ring-redemption story. (To quote the studio hand giving script advice in Barton Fink: “Wallace Beery. Wrestling picture. Whaddya need, a road map?”) But it certainly looks possible that the physical and emotional violence in Southpaw might be amped up substantially, which would be entirely in character for Sutter and Fuqua, whose last movie, The Equalizer, had little but high-impact violence going for it. Whatever the case, here’s hoping that Gyllenhaal stays healthy and doesn’t have to torture himself every time he goes out for a role. Love And Other Drugs 2, anyone?